The 2-Port USB KVM Switch lets you manage two PCs with just one set of keyboard, monitor, and mouse. Switch between two PCs with a simple press of a button! Separate sets of KVM cables are included with the KVM Switch, so users can start controlling 2 PCs instantly. The KVM cables also provide power to the KVM Switch, eliminating the need for a power adapter. Hot Key operations provide immediate access to features such as computer switching, and auto-scanning. 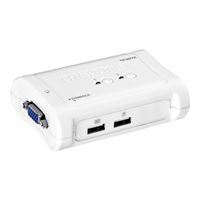 With its Hot-Plug, and Audible Feedback, the 2-Port USB KVM Switch is the perfect choice for managing multiple PCs. 3.9" x 1.1" x 2.8"